We are can’t wait for Spring out here in Iowa. Mid-February, it really warmed up, melting all of the snow. It was really just a big tease, though, because now there is snow on the ground again. I’ll reluctantly admit that it’s kind of pretty, but not as pretty as spring would be. To hurry things along, I decided that Paolo would have his first Botany Project. Last week I purchased a little mini terrarium, and in it we planted tomato, sweet pepper, cucumber, eggplant, and, of course, basil. 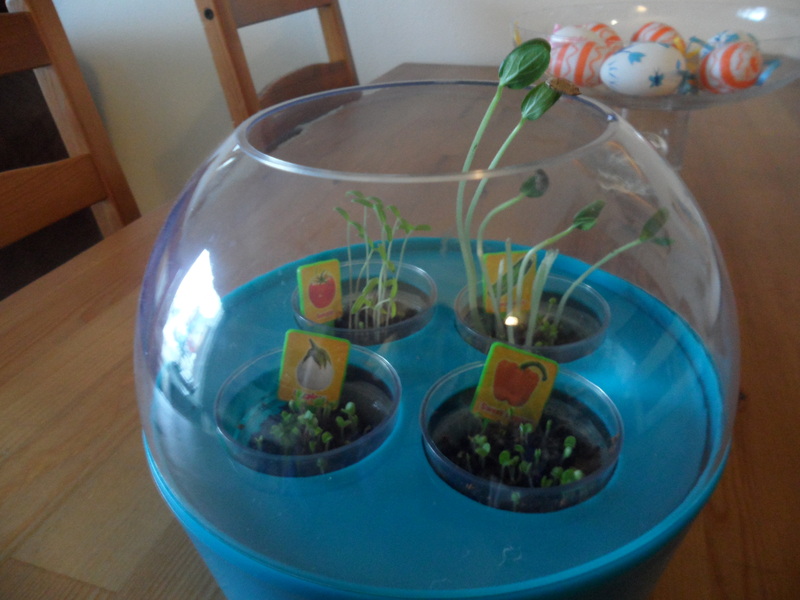 This took place exactly one week ago, and I can’t believe how quickly our little plants are growing. Pretty soon, we’re going to have to transplant them all into a larger pot. (Which will require G’s assistance. He’s the one with the green thumb.) Notice how four of the nine of the cucumber plants are cut in half? I accidentally decapitated them yesterday when I dropped the terrarium lid, crushing their skinny little stems. I was quite upset with myself. But it looks like they are making a come back. Che bell’idea! E come è grazioso il contenitore! Per coltivare le piantine ci vuole tanta pazienza e attenzione. Cara Brook ti annuncio che sto perdendo il mio “pollice verde”, ultimamente ho fatto morire tre piante…purtroppo !! What’s your email? Want to send you something.